Looking for a quick and easy summer appetizer or snack? This recipe features a delicious combination of fresh strawberries, tangy balsamic vinegar, and creamy ricotta served on toasted bread. Enjoy this refreshing summer cocktail recipe showcasing sweet strawberries, fresh mint, and whisky! Perfect to drink on a hot day! Sweet, tart, and fresh flavours collide in this refreshing healthy smoothie recipe. 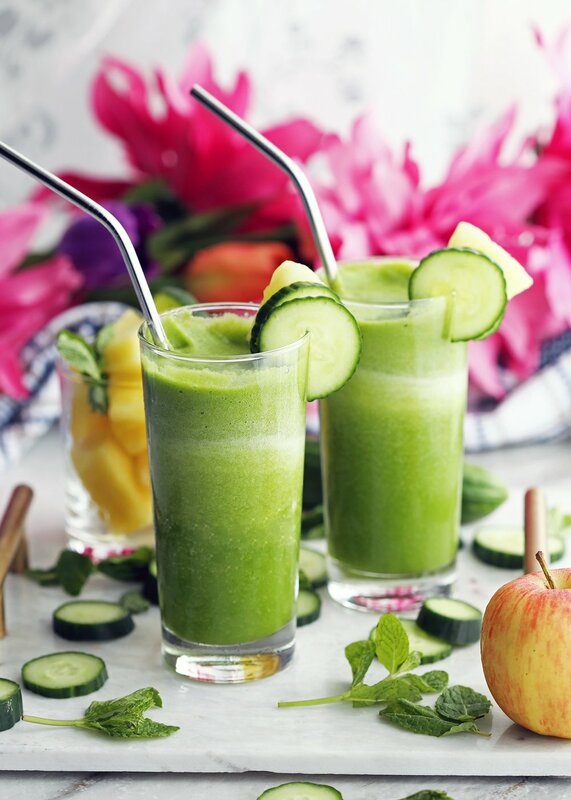 Pineapple, cucumber, and mint (plus more) blend together to make a quick breakfast or snack with no added sugar. Pomegranate Honey Moscow Mules are a lovely seasonal twist on the classic Moscow Mule. It's a festive and refreshing drink that’s perfect to sip on during the holidays! Refreshing, thirst-quenching watermelon cherry slushie is an easy, delicious drink that is wonderful on a hot day! Perfect for the whole family! Stay cool in the hot weather with refreshing Strawberry Mint Yogurt Popsicles! Super easy to prepare and only 4 ingredients. It’s low-fat and gluten-free too! This delicious cucumber salad with homemade lime-mint yogurt dressing is healthy, refreshing, ready in ten minutes, and goes wonderfully as a side dish for chicken, beef, or fish. A filling, delicious quinoa salad featuring fresh tomatoes, mozzarella, and herbs. Gluten-free, vegetarian, and nutrient-rich.